Serial connection, ideal for older, low-cost laptops or most desktop PCs. A USB-port version is also available; click here for full specs. Acts as a "dongle". No "Software activation" required! When used with this interface, VAG-COM is always fully-functional on any PC that meets our requirements. Full support for dual-K lines found in "new" (B6/8E chassis Audi A4 and 2002+ Audi A6 -- no VAS-6017 required -- no manual switches! OBD-II connector made to our own specifications. Fits even in the "tight" cars like '96 Audi A4's, '96/'97 Audi A6's and all European B5 Passats and B5 Audi A4's. Electronic protection against over-current conditions on both K1 and K2/L lines, no fuses required, eliminates the most common failure mode. 12 month guarantee against defects. 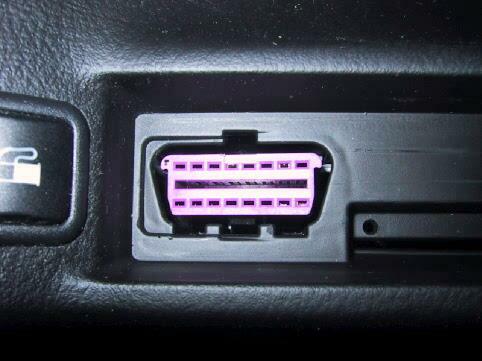 This interface comes with an OBD-II type connector which plugs in to most 1994 and newer VW's and 1996 and newer Audis. 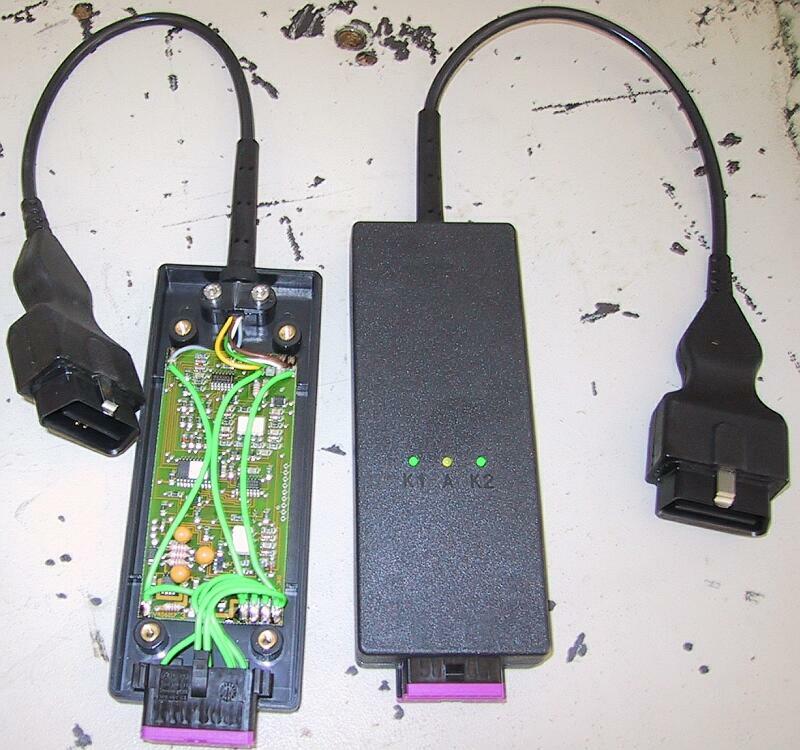 Most 1990-1995 Audis and 1990-1993 VW's have the "2x2" data link connector, click here for more info. This interface works with most diagnostic-capable VW, Audi, Seat, and Skoda models from 1990 through 2004 but does not work with any model requiring a direct CAN connection for diagnostics. If you have a 2003+, check to see if your car has a CAN connection. A 100 Mhz or faster PC running Windows 95 or newer with an available Serial port. If your PC does not have an available Serial port, you should get the KII-USB instead. The cable on this adapter is about 6 feet long -- just right for use with most laptops. If you want to use this interface with a desktop PC, you will need a standard serial (DB9M to DB9F) extension cord. We usually stock extensions in 15' (3m). See the Accessories Section of our Store for pricing. The KEY-COM acts as a "dongle" for VAG-COM, so VAG-COM will be fully functional on any PC you use with the this interface. However, product support is provided only to the original purchaser. If you buy a second-hand KEY-COM from someone and want support, you'll still need to pay $99 to register. Out of production -- no longer available. 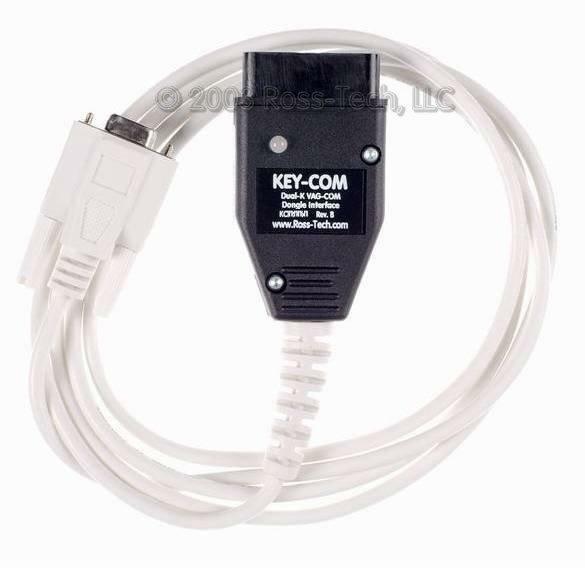 The KEY-COM should be used with the latest version of VCDS software. We do not sell any interfaces as a "Stand-Alone" products. We only sell them with our VCDS software.